As announced last year, we have chosen to internally phase out the word ‘employee’ for our people, instead calling each other ‘Primo,’ (Spanish for cousin, paying homage to our Cuban roots). As a family- owned company, we believe it carries with it the family spirit of Bacardi and reflects how connected we are to each other. Since our creation in 1862, our business has been built with a sense of being Fearless, a Founders Mentality and with Family and heritage at its core. 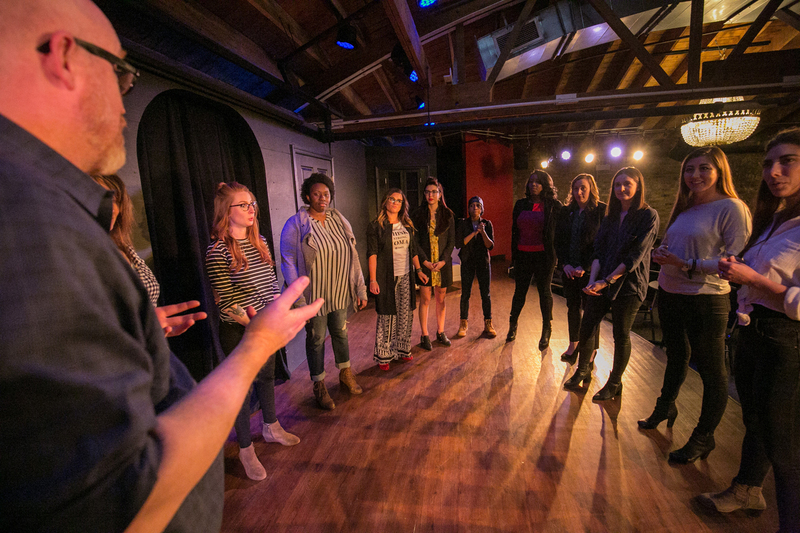 To unleash the power within our organization and help us realize our full potential, we want to reignite our culture by dialing up the distinctive aspects of Fearless, Founders and Family. Moving forward, these three pillars of our culture will guide our long-term goals in our People pillar Corporate Responsibility strategy. In addition, we recognize the importance of, and align our standards to, the UN Global Compact, the UN Declaration for Human Rights, and Fundamental Conventions of the International Labor Organization (ILO). Our people, whether direct employees or as members of our supply chain, are our greatest asset and our Code of Conduct and Responsible Sourcing Standards exemplify this commitment. In FY18, we launched our new Applicant Tracking System to increase our ability to tap into and select the right internal and external talent for Bacardi. 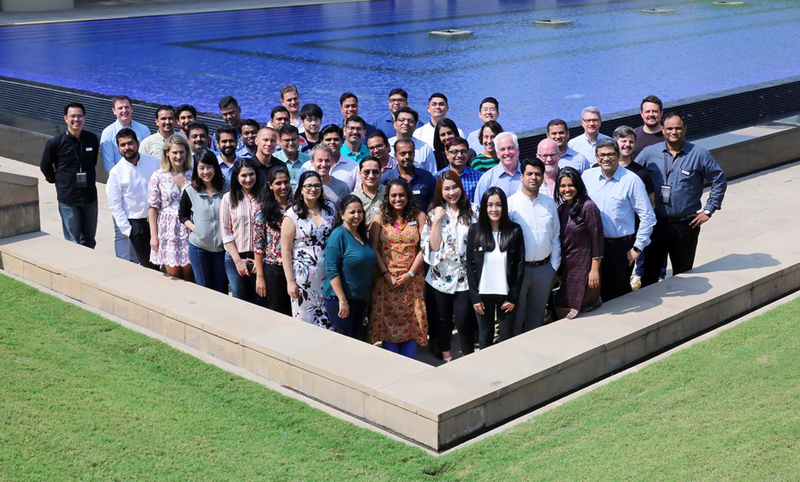 We also held the second edition of our Bacardi Ready development program in India, ensuring we are empowering the future leaders of our emerging markets. Building on past successes of our Women in Leadership (WIL) initiative, we started the WIL mentoring program in Eastern Europe and expanded our support of S.H.E. Summit. As of FY18, 36% of management roles were held by women; encompassing 38% of our total workforce. 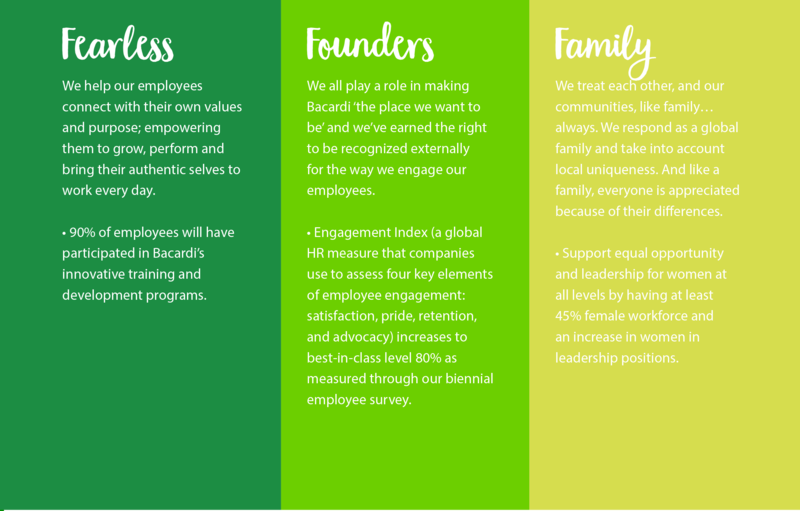 In addition, in FY18 we expanded Coaching to Win (a development program aimed at building fundamental coaching skills for Bacardi leaders to unlock the performance and potential of their teams) with multiple workshops reaching 300 employees globally. Eight new coaches participated in the International Coach Federation certification program with each supporting the deployment of Leadership Insights (a series of intensive diagnostic and coaching experiences at different leadership levels). Pro-bono coaching hours for the new coaches were committed to supporting one of the projects of our NextGen development program. Our newly launched Good Spirited global goals include one specifically about taking care of and supporting our people. In our hiring strategy, we also recognize the importance of globally reflecting the diversity of our operations among our employees. The targets under this goal include references to our culture pillars: Fearless, Founders, and Family.